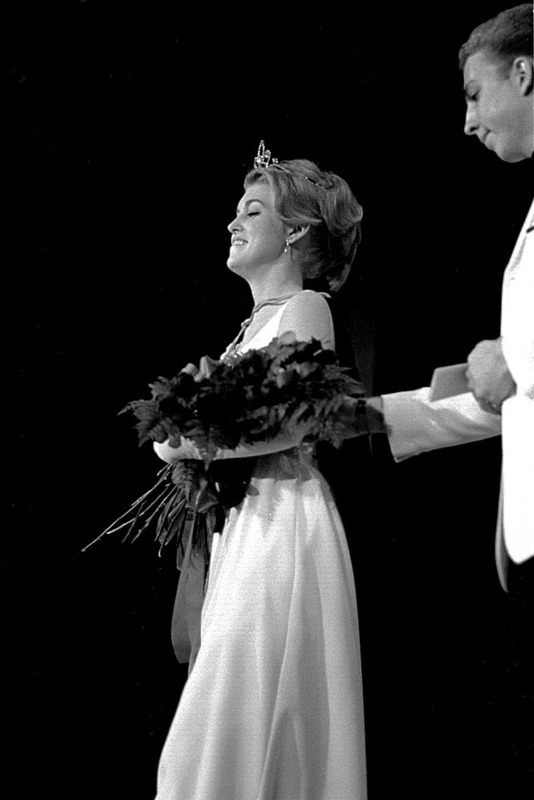 Miss Judy Mullins, a State College senior won the 1967 Miss Cape Girardeau title, The Missourian reported May 6, 1967. Shoving modesty aside, I’ll have to mention the headline that ran directly beneath the Miss Cape piece: “Missourian Named Best Daily Newspaper in State.” Some kid named Kenneth L. Steinhoff won first places in News and Feature Photography, a second place in Sports Photography and two honorable mentions to help the paper score the points needed to capture the overall award. She was selected over 10 other contestants. 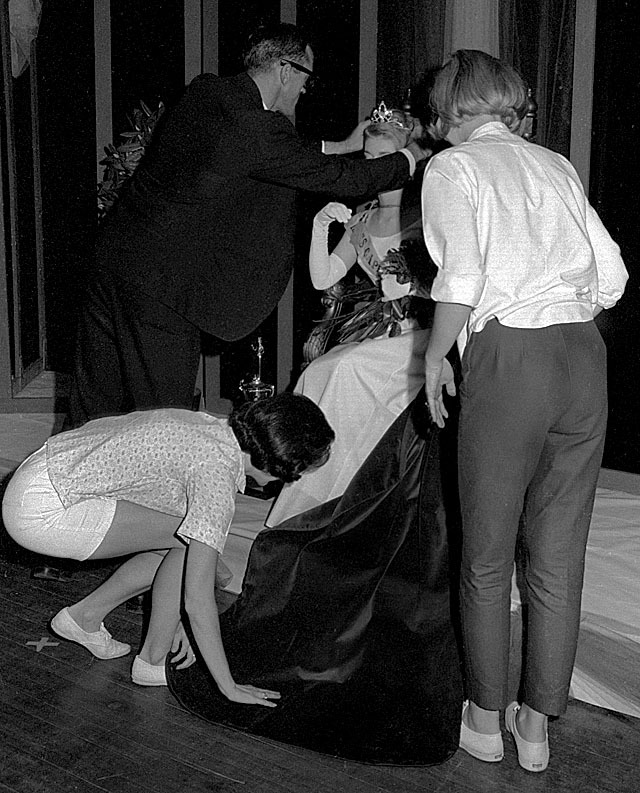 “‘Give us some idea of the work that went into that production,’ said Master of Ceremonies Jim Walling. Very seldom did my favorite photos make the newspaper, which, for some silly idea, wanted “news” photos. 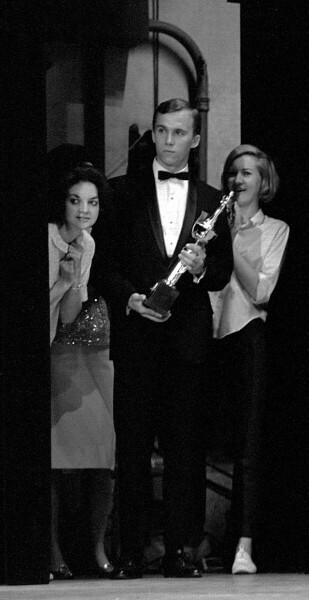 I liked stuff like the folks watching from the curtains. If you were in tight with the contest officials, you might get tipped off who the winner was going to be so you could be in the right position. 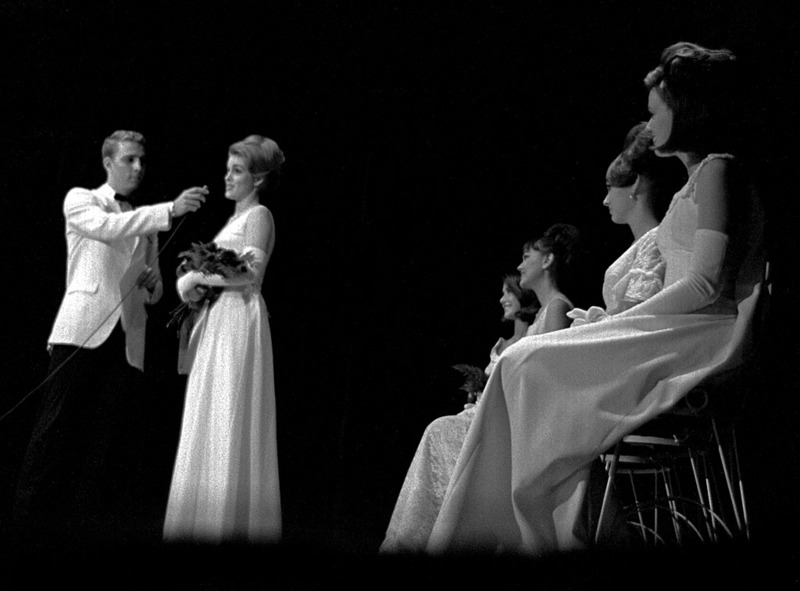 I put coronations and weddings in the same class: these are things you do NOT want to screw up. Brides and queens aren’t forgiving if you botch their big day. Here’s the photo that ran in the paper. 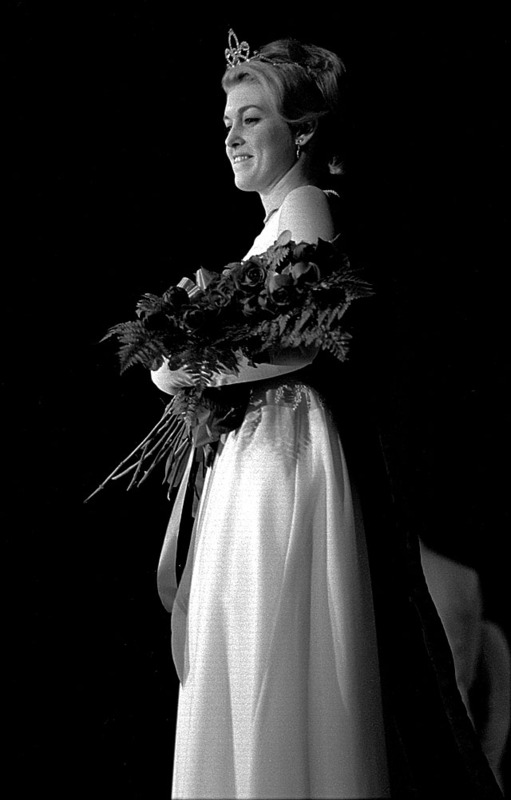 Miss Judy Mullins of Farmington, the first Miss Cape Girardeau, accepts a bouquet of roses from John Heskett at her coronation Friday night in Academic Hall Auditorium at State College. Jim Walling, master of ceremonies, is at right. 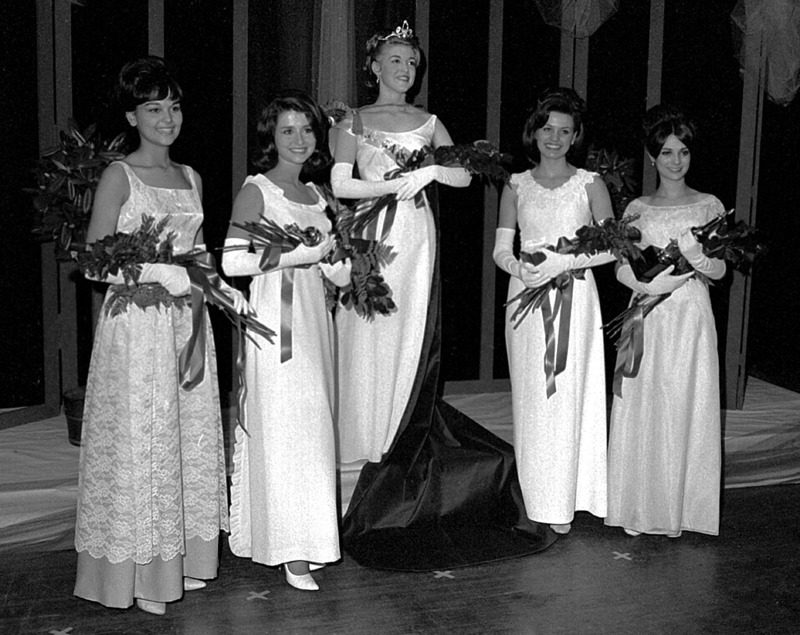 Miss Cape Girardeau candidates pictured are, from left, Miss Jean Siemers of Cape Girardeau, Miss Mary Ann Rice of Fredericktown, Miss Vickie Boren and Miss Tana Austin of Cape Girardeau. 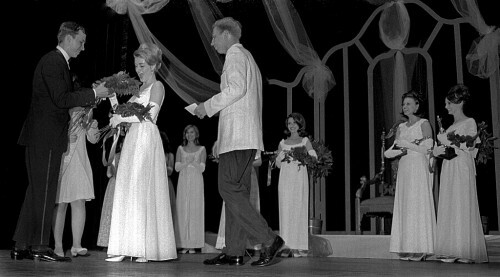 “First runner-up Miss Mary Ann Rice, a state college freshman, won the talent competition. The Fredericktown co-ed sang “One Kiss.” Miss Rice recently was selected Miss Beautiful in the 1967 Miss Beautiful-Ugly Man contest as State College. She is the daughter of B.G. Rice. 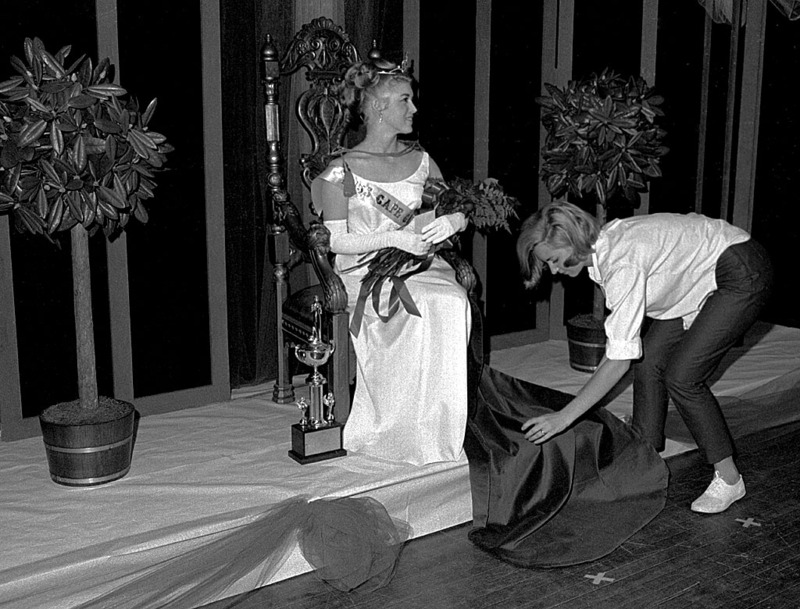 “Miss Tana Austin not only was chosen for the queen court but was also selected as Miss Congeniality. The daughter of Mrs. Opal Austin is a sophomore at State college and sang in talent competition. 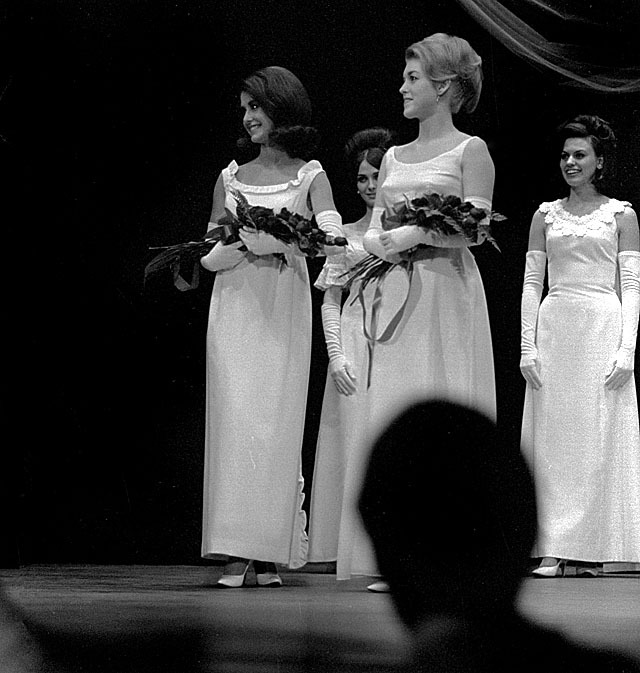 “Other contestants were Miss Linda Young, State College sophomore from Little Rock, Ark. 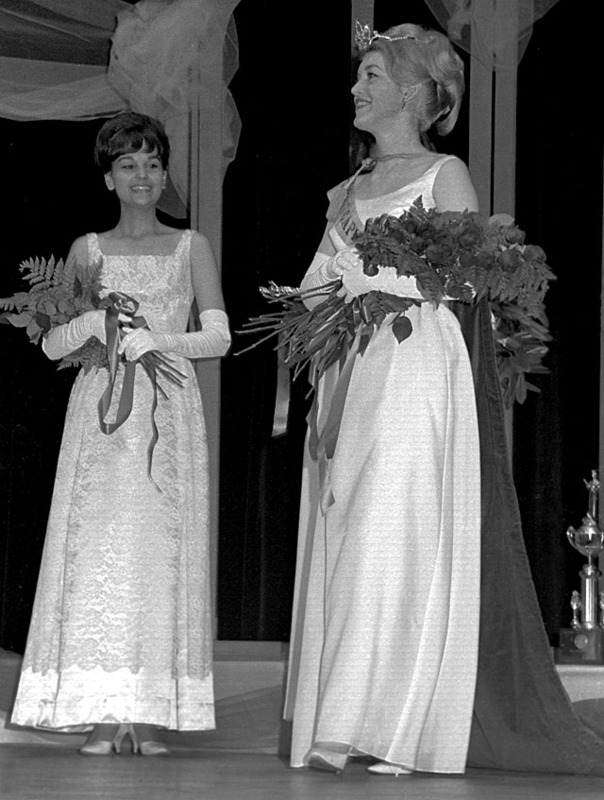 ; Miss Rosemary Young, Central High School senior; Miss Jean Siemers, State College freshman. 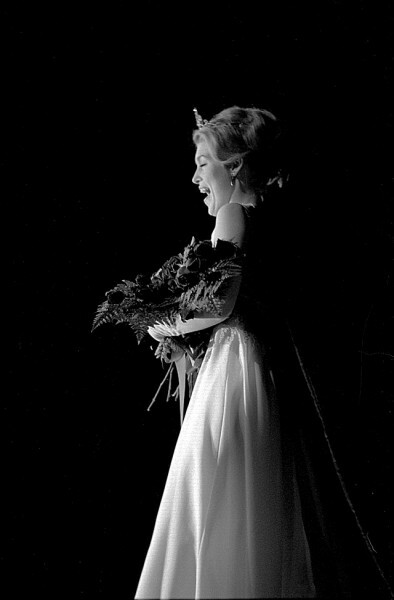 “The 5-foot, four-inch blonde from Farmington will now represent Cape Girardeau in the Miss Missouri Pageant at Springfield this summer. How much longer do we have to stick around? I can identify with the guys on the right side of the stage checking their watches. Click on any picture to make it larger, then click on the left or right side of the image to move through the gallery. Thanks, Jim. Knowing you, you just stopped by for the swimsuit competition. 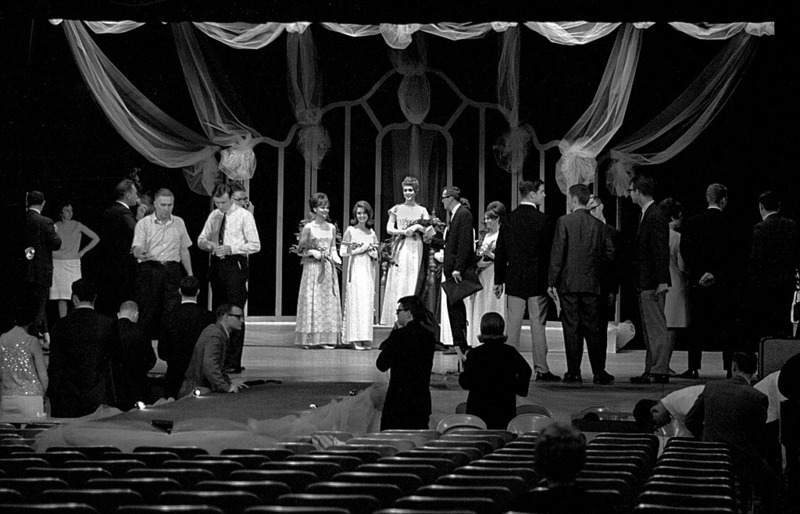 I did drop by for some swim suit lookers…but oh well, you did work for the Missourian and this was 1967. Glad you covered this…Kathy Slinkard was a favorite of mine from a distance. 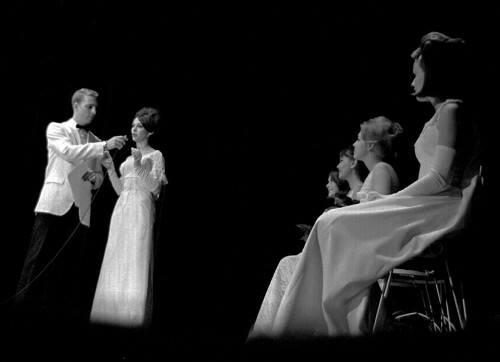 She later married Jimmy Velvet (that Jimmy Velvet) and would see them sing around the Southeastern states in the 70’s and visit with them after the show. I think she lives in Southwestern Missouri now. Nice lady, beauiful and sings like a bird! Terry, I haven’t seen Kathy Slinkard since high school, but remember what a kind and lovely person she was then. I think she was one of those people who was born poised! Another talented singer in the court is Vicki Boren. I last saw her in the mid-70s when she was performing in St. Louis. She and Rosemary Young were CHS ’67. You can find Kathy Slinkard on facebook. 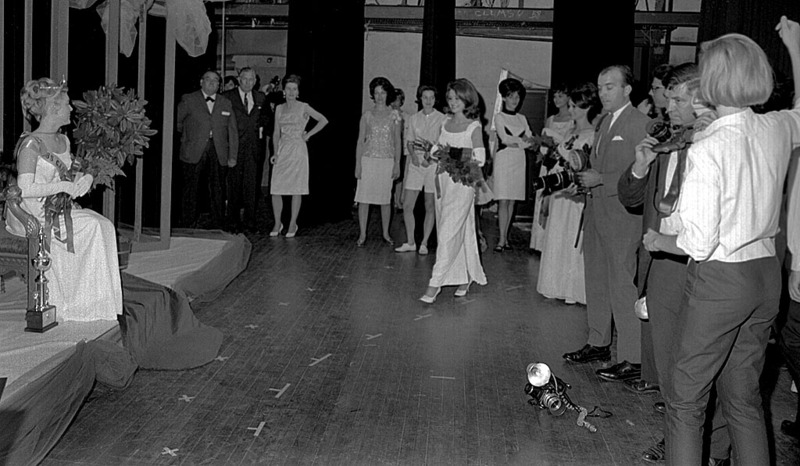 Technical pageant question: do they do a weigh-in before the competition as they do in boxing to get the girls measurements? Is that open to the public? I loved seeing these photos! They’re wonderful memories! I had a great time, and was really honored to be in the court, but scared to death! In fact, I did trip on the runway! Oh well! My Mom was a great seamstress and made the gown I’m wearing. It was my Senior Prom dress! I just saw the most beautiful photos of my mother, formerly Kathy Slinkard. Her voice is still breathtaking. Thank you for posting! Your mother caused many a Central High School male heart to throb.